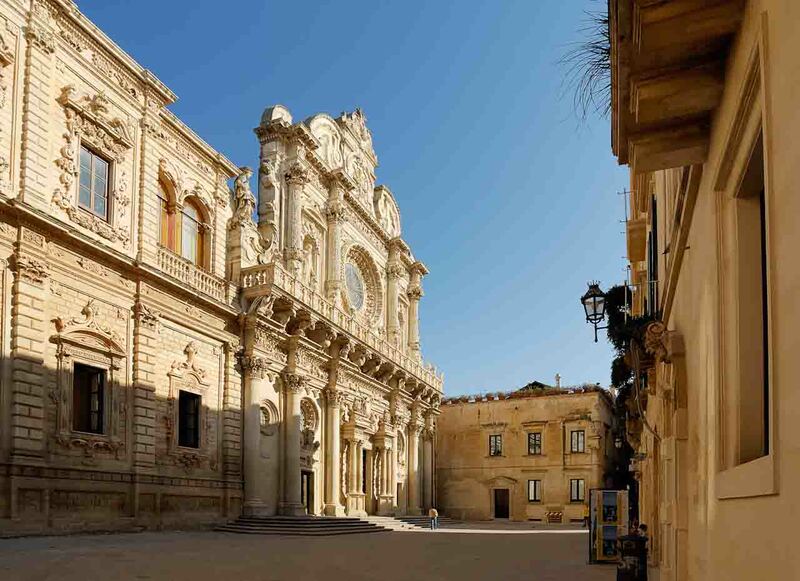 Lecce has always been considered the main center of the baroque architecture. Its art was quite singular, for the extraordinary characteristics of the stone used. The city possess great, unusual elegant churches and palaces, adorned with friezes, adornments and rich and elaborate decorations. You can visit the most important monuments as well as artisans’ workshops and taste the typical products of Salento; olive oil, wine and taralli. 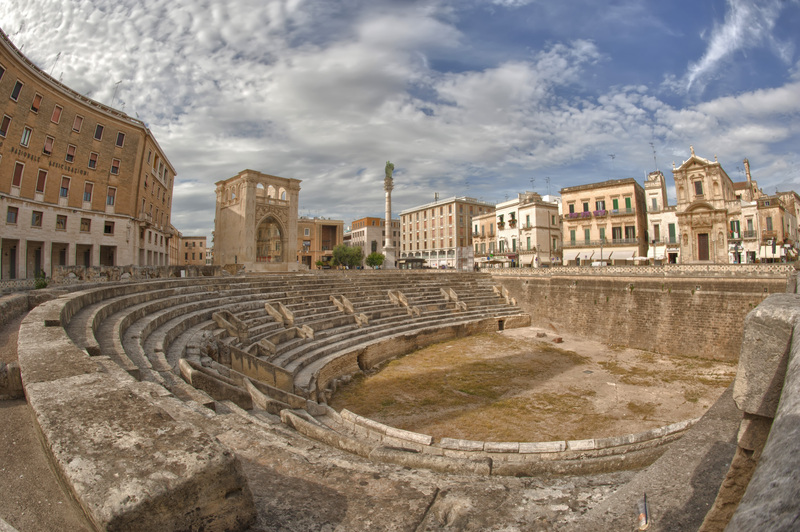 Porta napoli is the starting point for a short walk in Lecce. The arch was erected in XVI sec., in honour of King Charles V and the obelisk bears the symbols of the towns in Terra d’Otranto. 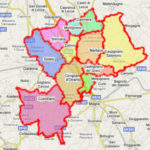 In Via Palmieri many noble mansions can be seen, such as: Palazzo Marrese and Palazzo Palmieri. You reach Piazza Duomo and visit the Cathedral built by G. Zimbalo in form of latin cross with three naves. 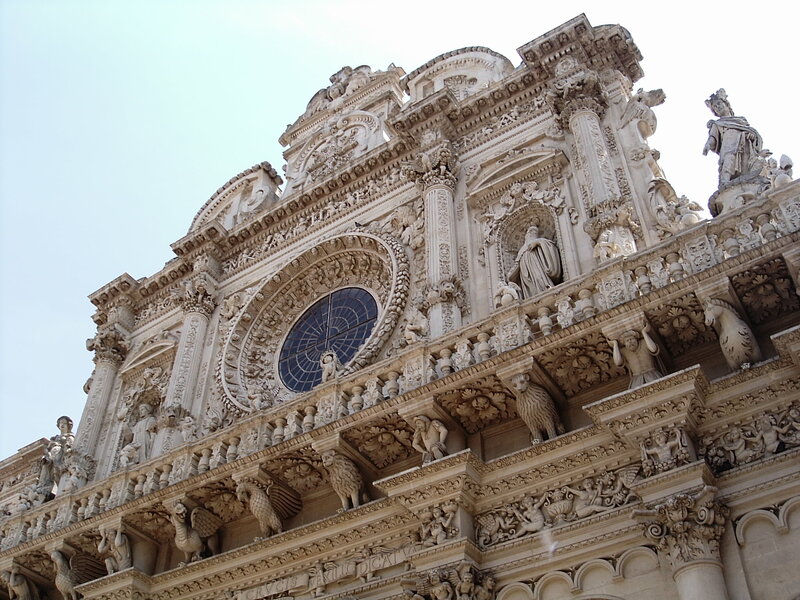 The second façade is similar to a triumphal arch with the statue of S. Oronzo, patron saint of Lecce. The bell tower (70m), the Bishop’s palace and the Seminary with a beautiful Baroque well dominate the square. The Basilica of Santa Croce is the most remarkable example of baroque style, joined to the ex-monastery seat of the religious order of Celestini and today the seat of the provincial administration (Palazzo del Governo). In the famous St. Oronzo square you can find the ruins of the Roman Amphitheatre, the Sedile (the ancient Seat of the Mayor), the small church of S. Marco and the column of St. Oronzo surmounted by a statue of the Saint.